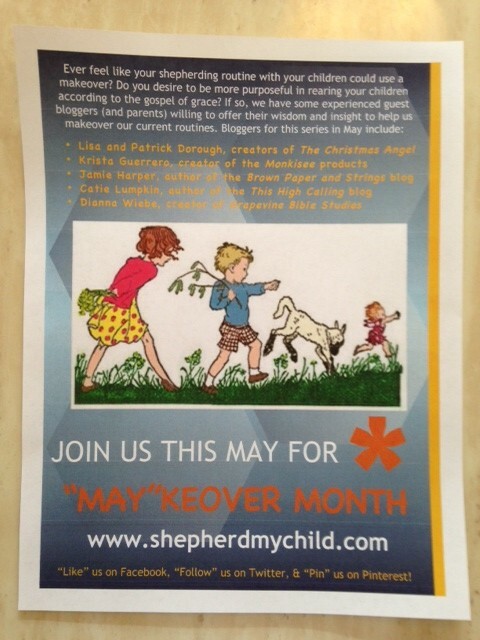 “MAY”KEOVER MONTH starts tomorrow – a few details…. It’s time for “May”keover Month and I am so excited about what God is going to reveal to us through this series (which beings tomorrow)! I’ve received 3 of the 5 articles from the guest bloggers so far, and they are all so wonderful and different! I pray there will be something in this series to speak to everyone joining along. Please know that everyone participating in this series is a sinner saved by grace and far from a perfect parent (the only one who can claim that title is God Himself!). Yet, everyone participating has been through or is travelling through the journey of parenting and can offer helpful insight and suggestions to encourage us in our journey to shepherd our children (based upon what has or has not worked in their own experiences). We are not here to “judge,” but to “spur one another on toward love and good deeds” (Hebrews 10:24), to “encourage one another and build each other up” (1 Thessalonians 5:11) and to figure out how to “preach You, Dear Jesus, without preaching…not by our words but by our example.” (quote from Mother Theresa). 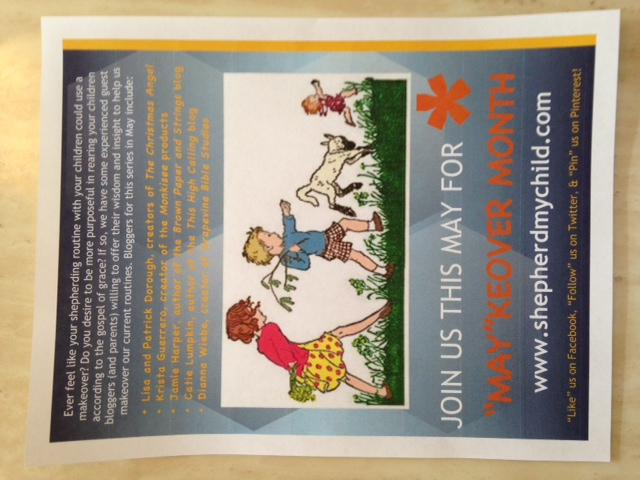 The series kicks off tomorrow (May 1) with Krista’s article titled “May”king Yourself a Deliberate Parent. Join us tomorrow for the first post and let’s see what we can do to become more deliberate in our shepherding routines!